So we have finally moved house! From spending weeks packing boxes endlessly and thinking of all the things we want to do when we get there, to the actual day of the move and those fleeting thoughts that pop up – “We are actually doing this?! Oh god, have we made the right decision? “ The whole experience has been a real whirlwind. I quickly realised that my subconscious feeling that moving day was the end of the mayhem was far from the truth. In fact, it marked the beginning of the unpacking of all those boxes! After a long overdue sleep the real excitement kicked in and our new house project officially began! 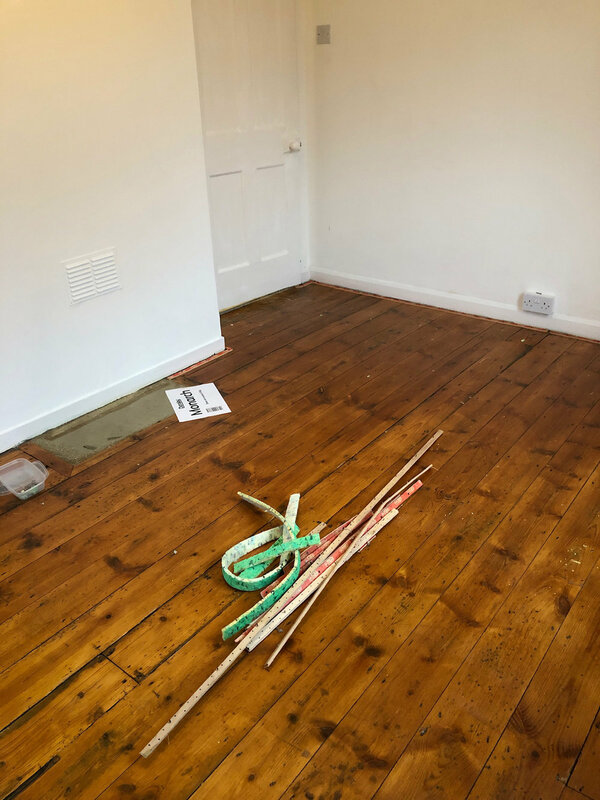 My first plan (ignoring all the unpacking) was to take up the old grotty carpets with the goal being to find floorboards we can then begin sanding down and treating. So typical impatient me, we began by ripping up the master bedroom carpet on move in day… I could not have been happier! 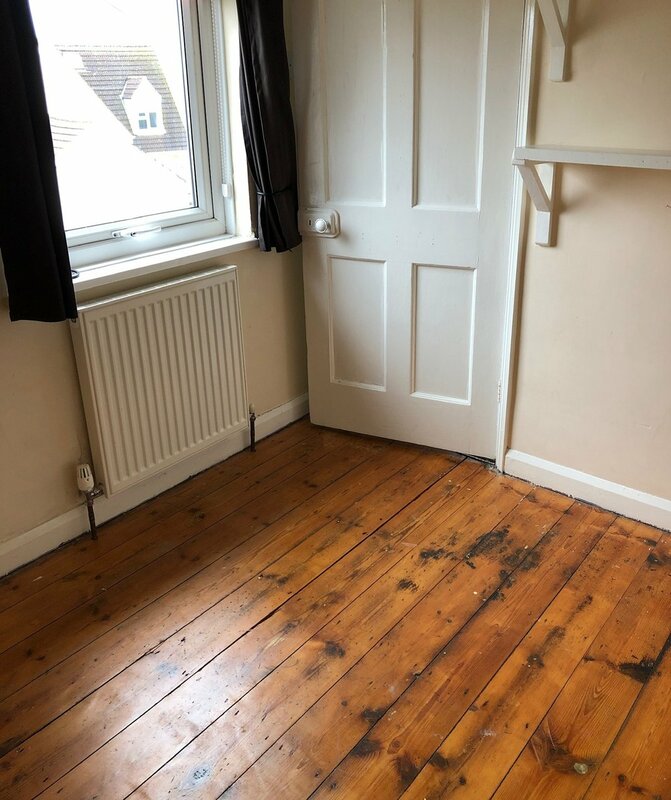 Beneath the carpet and underlay we found original pine floorboards already sanded and varnished, and overall in great shape – it made my day! 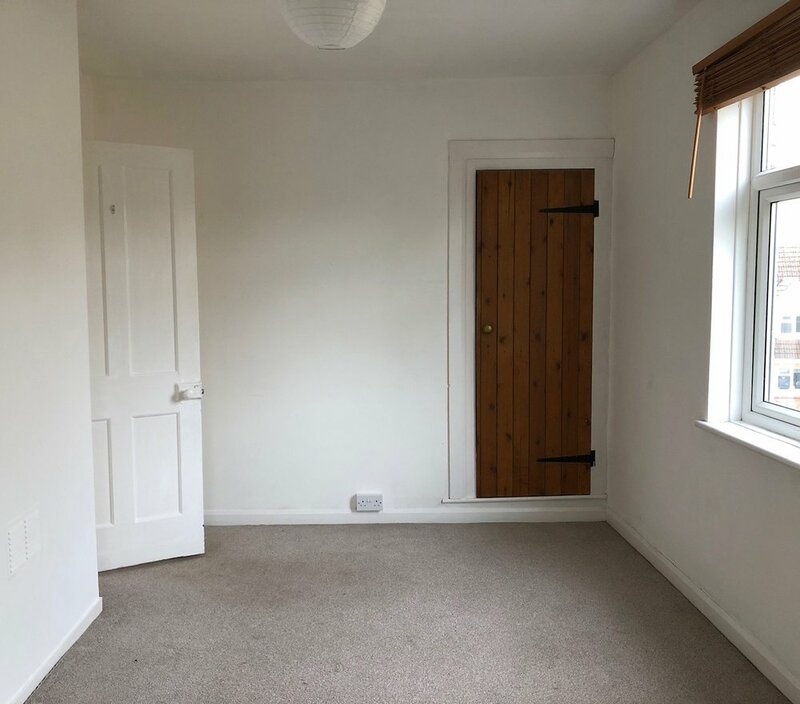 This discovery gave me the energy to take up the carpet in the other two bedrooms, the landing and finally the stairs. My luck continued in the bedrooms, however, the landing and stairs are not in such good condition. I can’t complain though as it has seriously reduced the hours I will spend sanding! 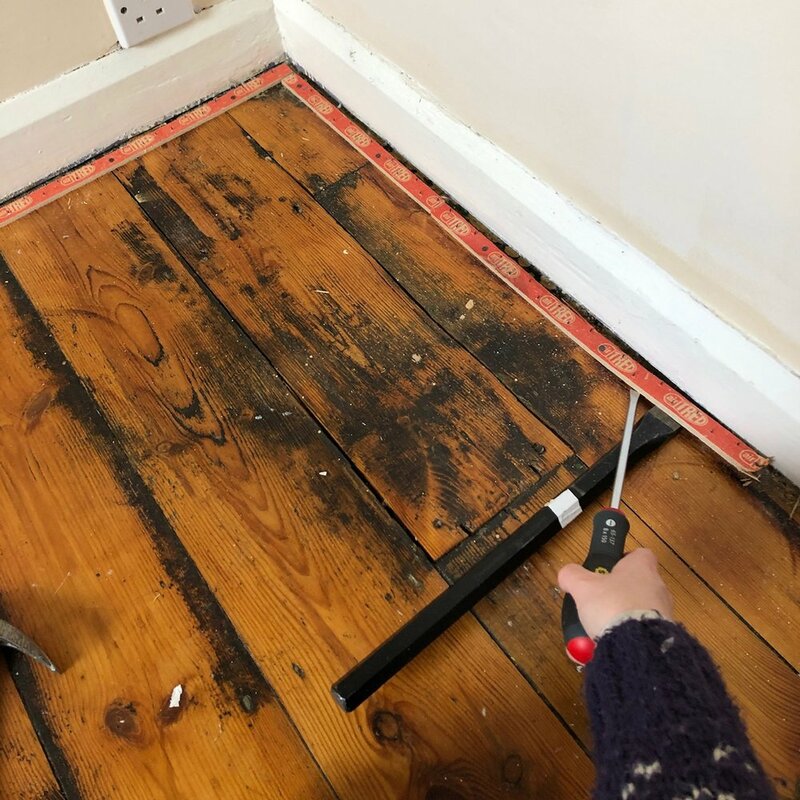 Unlike in the three bedrooms, the underlay on the stairs and landing had been glued down which has left residue on the floorboards beneath. 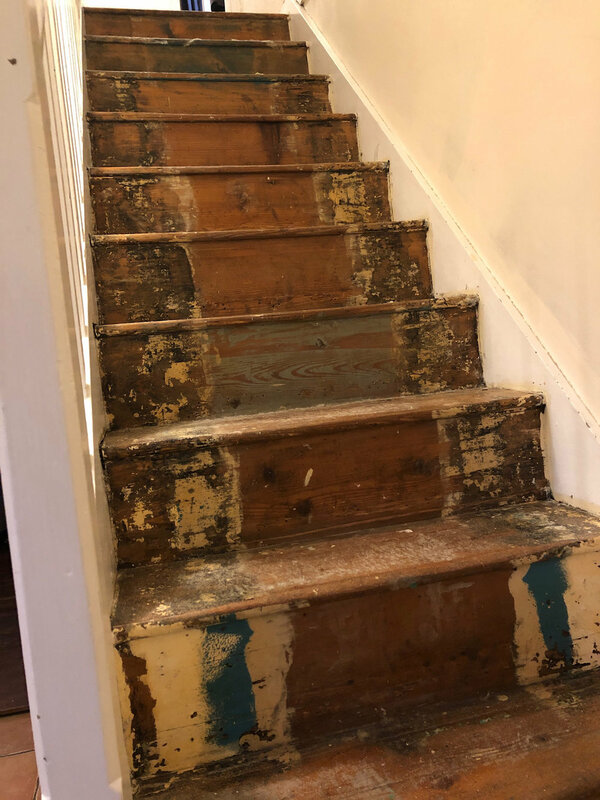 In uncovering the stairs we have found some areas in great need of repair which otherwise would have gone undiscovered and could have become dangerous. Now we have strengthened the treads where necessary and I intend to sand off the old paint, glue and dirt and give them some all round love and attention to bring them back to life. But for now we have some very creaky old wooden stairs – much nicer than the sad old carpet that was there before!